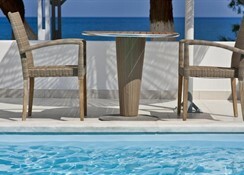 Guests can explore a touch of style and a holiday with a difference when they head to Santorini and stay at the 4-star Alesahne Beach Hotel. The hotel is in a prime location where guests can step out onto the beach or choose to explore the surrounding area and its wonderful attractions. The hotel has an on-site restaurant and pool bar as well as an outdoor pool and stylish rooms, ensuring guests can really feel at home from the moment they arrive. 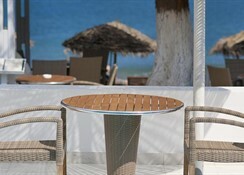 For those who are looking for a sunshine getaway in a modern setting then the Alesahne Beach Hotel captures it all. 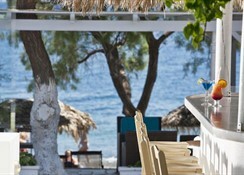 For those who are looking for a beach holiday in a prime location, the Alesahne Beach Hotel ticks every box. Located on the beach, spending the day sunbathing is simple while the resort centre has plenty to offer in the form of restaurants, bars and boutique shops. This magnificent destination is steeped in history and so, there is a range of museums, cathedrals and monasteries in the area. The hotel is an ideal destination for those who are looking for that perfect blend of relaxation and sightseeing. The hotel is 8km from the airport. 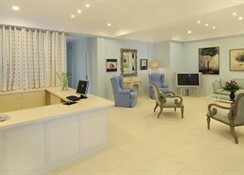 This elegant complex has a total of 28 guest rooms and all of which are designed to cater to the needs of all guests. The modern and elegant rooms offer all the comforts that guests could need during their stay including a private bathroom, hairdryer, mini fridge, sitting area, satellite TV, Wi-Fi, telephone, safe, air conditioning and a balcony. Guests can dine in style at the on-site restaurant where they can sample an impressive choice of dishes in an idyllic setting with great views. During the day, guests can unwind at the outdoor cafe or head to the pool bar where they can find a great choice of beverages on offer. If guests want more choice they can take a trip out of the resort and head to some of the bars and restaurants located in the area. With a sun terrace and two outdoor pools, guests can spend hours soaking up the sun and cooling off in the pool. The private beach is the ideal spot for some peace and quiet while guests who like to keep busy can enjoy a game of beach volleyball. There is a massage service on offer for those who like to unwind in style. Small hotel and rooms a little tired, but spotlessly clean with warm, welcoming staff. Exterior pool area was lovely and the perfect place to relax in the Santorini sunshine. Great location and the staff were both friendly and helpful. Would recommend to any couples and hope to return in the near future. The only reason it did not get 5 stars.